Shop for unique gifts, watch a festive parade march by, and conquer an obstacle course in your favorite festive pajamas. 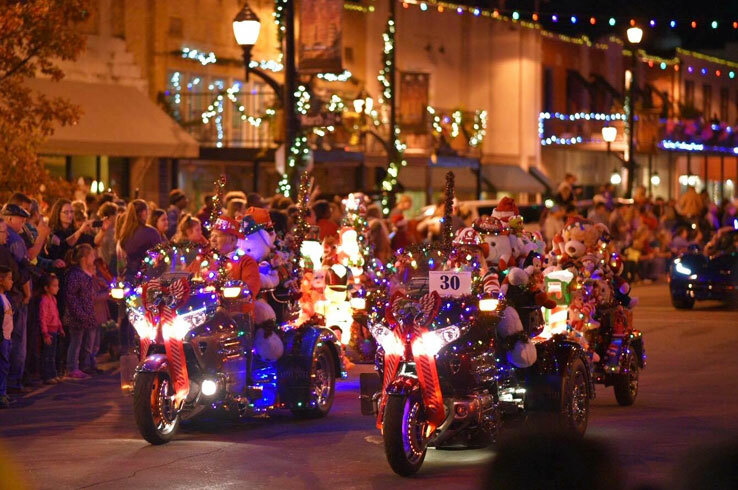 These are some of the things you can see and do during the holiday season in Kilgore. Located in the heart of East Texas just two hours east of Dallas, Kilgore is an inviting town that takes its Christmas celebrations seriously. From late-night shopping soirees to a performance by none other than the Kilgore College Rangerettes, there are a multitude of events that’ll give you and your family plenty of yuletide cheer. Learn more about a few of the upcoming holiday events in Kilgore and plan your next getaway here. The days before Christmas are hectic, but you won’t feel any of that pre-holiday stress when you visit downtown Kilgore for Jingle All The Way. Cross your last gifts off your list, then hang around to savor the spirit of the season. 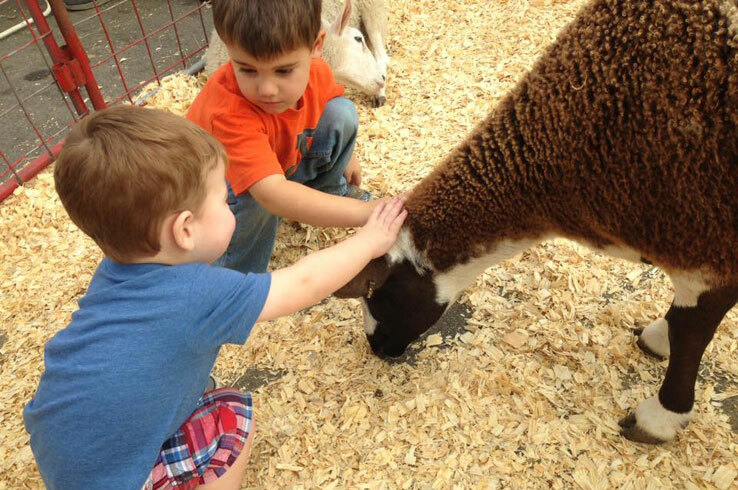 Listen to live music and let your kids make new furry friends in the petting zoo. Special carriage and pony rides await, and Santa himself drops in for story time. Make sure to drop by the historic Texan Theater, which is hosting a Christmas movie marathon throughout the day. Get an early start on your Christmas shopping and discover the many surprises downtown Kilgore has to offer during Mingle & Jingle. Browse a collection of jewelry and one-of-a-kind gifts for all ages at The Shops on Main, Kilgore or the vintage-style clothing at Everything that Blings throughout the evening, when all the stores stay open for after-hours shopping. Don’t miss Santa Flavious and tours by the Kilgore’s very own mayor. 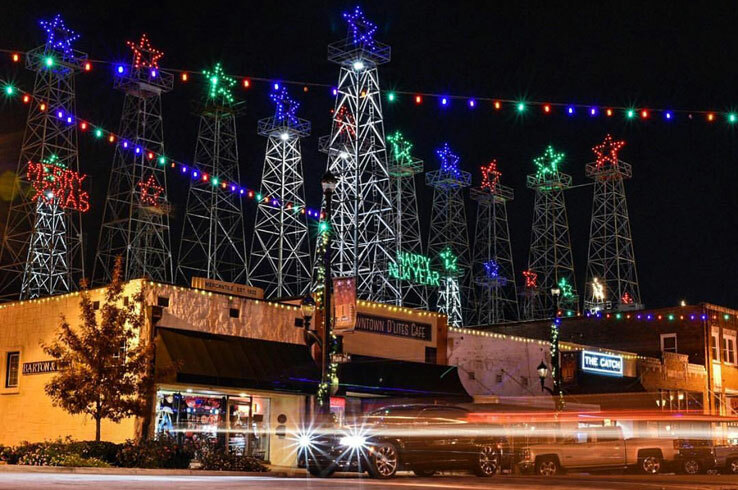 Take your time as you explore the downtown area, admire the illuminated stars atop the oil derricks, and start your holiday season in style right here in Kilgore. It wouldn’t be the holiday season without a Christmas parade, and Kilgore’s own fills the downtown area with more than a stocking’s worth of festive cheer. A nearly 90-year tradition, the Kilgore Christmas Parade features more than 80 floats decorated for the season. This year’s theme is the Polar Express, a classic Christmas story about a young boy’s journey to the North Pole. Santa and Mrs. Claus will also make an appearance, giving your kids the chance to tell them what they’d like for Christmas. 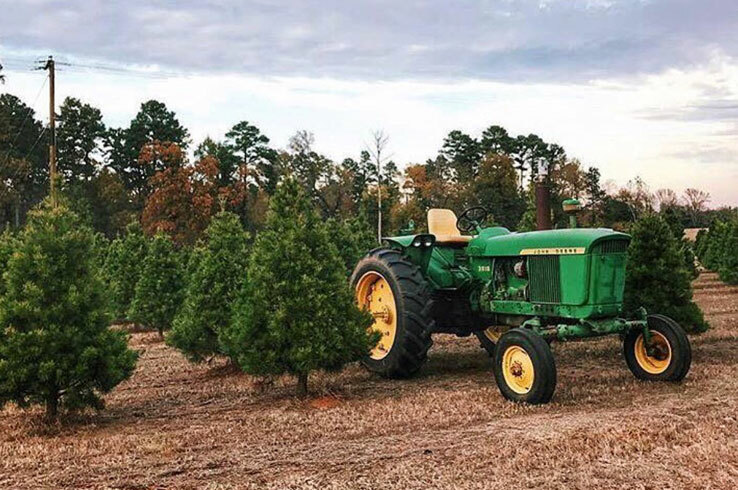 Finding a Christmas tree of your own is one of the best parts of the holiday season. Although you can visit any old run-of-the-mill tree lot, why not instead pick your own at Danville Farms? Visit during the weekends and you’ll have your choice of live trees that you can cut and take home with you. Danville Farms even brings in Fraser Firs from northern California, giving you more options to choose from. Bring your kids for a memorable day choosing the perfect tree, peruse the gift shop, and enjoy the sweet aroma of fresh firs. 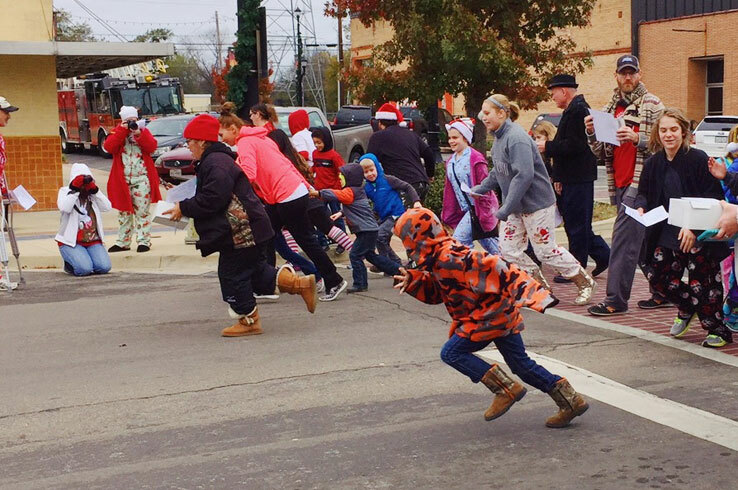 Don your finest Christmas pajamas and head to downtown Kilgore for Dashing Through Downtown, a fun “run” unlike any other. Laugh your way through an obstacle course along North Kilgore Street, then listen to festive music by local favorites Pine Nutz before making your own holiday wreath. Fun for the whole family, Dashing Through Downtown is a unique way to celebrate the season. Since you’re already in downtown, get some of your Christmas shopping done and warm up with a cup of coffee from Whistle Stop Coffee House. No time in Kilgore is complete without seeing the world-famous Kilgore College Rangerettes celebrate the season with their annual holiday show. Held at the Dodson Auditorium on the campus of Kilgore College, the Rangerette Christmas Show also includes guest performances by the Kilgore High School Hi-Steppers, the KHS Coed Dancers, and other local dance groups. Tickets for this year’s extravaganza are available at the Dodson Auditorium 45 minutes prior to each performance at either 2 or 5 p.m., or by calling the Rangerette Box Office at (903) 983-8179. Imagine the kind of world in which everyone gave you cookies for just walking in the door. In most cases, that would be too good to be true. Yet this dream becomes a reality during Deck the Halls here in Kilgore. 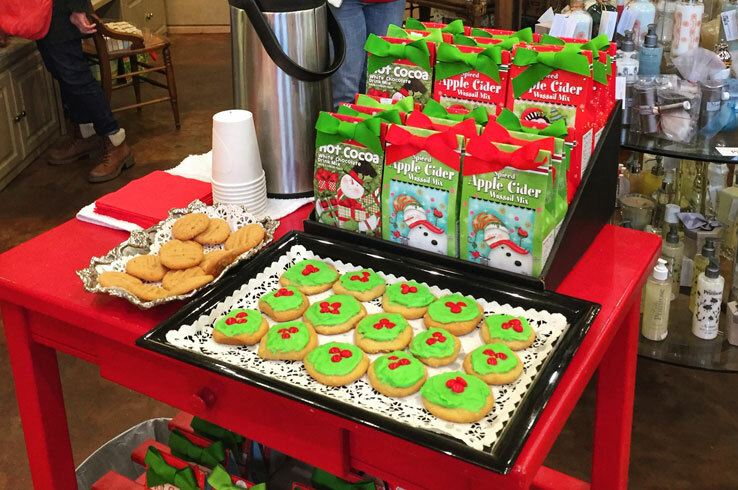 Make your holiday shopping even more delicious as you visit the shops and restaurants in downtown Kilgore, collecting cookies along the way. Each person gets one cookie per shop, and you can add them to your very own box (or eat them right away). Santa will even be on hand to tell timeless Christmas tales, and the Grinch may even show up. Don’t worry; this is one holiday celebration even he won’t try to ruin. Experience the magic of the holidays in Kilgore, where all the festive events will make your Christmas season unforgettable. Learn more about Kilgore and plan your visit here.